Gospel, R&B, soul, funk—all these genres have something in common: blues. When people think of blues, their minds tend to go straight towards sad singing with a 12-bar progression behind it. And, to be fair, that is a lot of blues. But blues laid the foundation for an entire generation of music, the effects of which ring loud and clear today. It’ll only take one listen to the records we’re writing about today to show you just how deep blues goes. The Hannibal in this record is better known as “The Mighty Hannibal,” or maybe “King Hannibal,” depending on the decade. 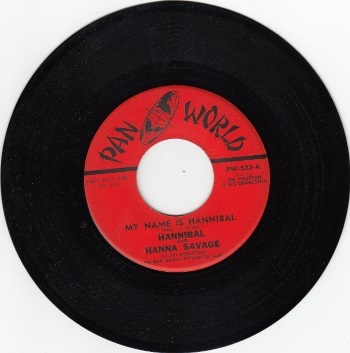 He changed his stage name multiple times throughout his career, and it was pretty early on that he went by just “Hannibal.” This single was Hannibal’s 5th ever release, and his 3rd as “Hannibal.” Before then, he went by his given name: James Shaw. He went on to record three full albums, but he is best known for his single “Hymn No. 5,” which he released in 1966. Hanna Savage, on the other hand, appeared on this record only before disappearing forever. Whether she went onto other pursuits or took on a stage name, nobody knows. The 45’s A side, “My Name is Hannibal,” lures you in with is gospel-like chanting before erupting into an explosion of percussion, guitar, and blues, giving the song a rough feel. The heaviness of the percussion (and the tambourine that later exaggerates it) contributes heavily to this effect, not to mention the screaming present later in the song. Despite Hanna Savage’s place on the album label, she has a small role in the song, serving only to fill the call-and-response spot that’s such a staple of the genre. But Hanna can sing, and it shows in the 45’s B side, “Fall in Love with Me.” In fact, we can’t find any trace of Hannibal in the song at all! Unfortunately for you, the song is all but impossible to listen to online. The closest you can get is the 1-minute sample on our website. If you want to hear the rest of this beauty, you’ll have to order the record yourself. But we will say this: fans of doo-wop will find themselves right at home with this one. If you’ve heard of any of our three groups/artists today, we’d wager it’s Freddy King. Called by some as one of the “Three Kings” of electric blues guitar (along with Albert King and B.B. King), Freddy King is a force. In fact, he was voted 15th of the Rolling Stone’s 100 greatest guitarists. This 45 came out in the middle of King’s career, and it doesn’t get nearly as much attention as his other hits, but don’t let that put you off: this record has a lot going for it. When it came out, “One Hundred Years” wasn’t quite the Northern Soul scene’s cup of tea. That changed, though (the Northern Soul scene is alive and well, after all! ), and now the song is an “all-nighter,” a record played during a Northern Soul’s all-night dance sessions. And it’s no wonder: even by modern standards, this is one catchy rune. King’s booming voice and smooth electric hollow-body blues guitar find themselves backed up with maracas in this song. It also sounds quite a bit like “Stand by Me,” which came out two years beforehand. Funnily enough, (I’d Love to) Make Love to You, also has a backing track similar to “Stand by Me.” But the similarities stop there. The combination of piano, trumpets, guitar, and King’s singing makes the song seem to bounce. But believe us: it will sound much better on your record system than online. After you listen to this 45, you’ll wonder how Jeannie and the Darlings only lasted three years. There was so much personality and soul behind their voices that we’d have expected these three to go on for many more years. A biography of theirs says they also recorded some music as the Dolphus Sisters, but that music seems to be lost to the world. “What’s Gonna Happen to Me,” on the other hand, is blues in the truest sense. A common blues progression backs the Darlings’ sad tune recalling the heartbreak that comes with a lost lover. It provides a perfect contrast to the A side’s energetic tune.